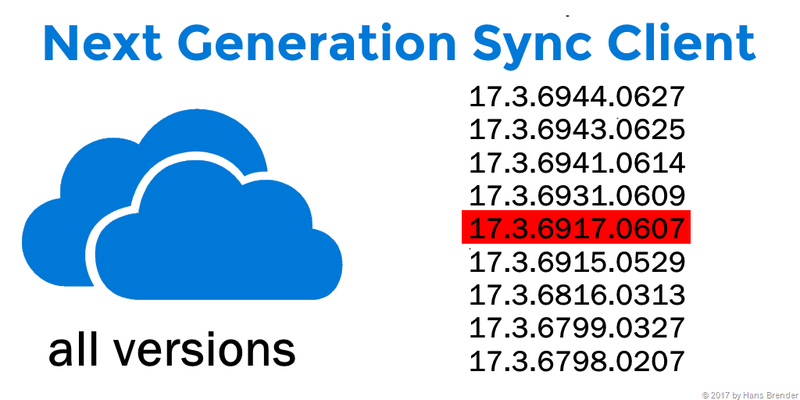 Startseite > Next Generation Sync Client, OneDrive, OneDrive for Business	> OneDrive for Business – which Version of the NGSC do I use? OneDrive for Business – which Version of the NGSC do I use? Where do I get the newest NGSC Client, to manually install (update) it? an my answer is always: You do not need to update it manually. Let’s see the background: Updates from Microsoft for the NGSC do not come via Windows Update nor to Windows Software Updates (WSUS) nor through the Click to Run mechanism of Office. Microsoft used this way, to sync it’s cloud changes and also the client, not dependent on User or administrator. If yes, an automatic upload is initiated and a new NGSC will installed. and what’s the newest version? So it looks, that at this time, writing this blog post, the version 17.3.6944.0627 is the newest one. It is a guess that this version was installed with me on Windows 7 and 8.1 as an update because on these devices the registry key TeamSiteSyncPreview was set to synchronize document libraries on SharePoint Online (TeamSites, Groups, Microsoft Teams). Besides, I do not carry out a manual update! When you download the latest full version of Windows, you get version 17.3.6799.0327. Global Conference 2017 – 1st /2nd of November 2017 OneDrive for Business – welche Version des NGSC benutze ich?